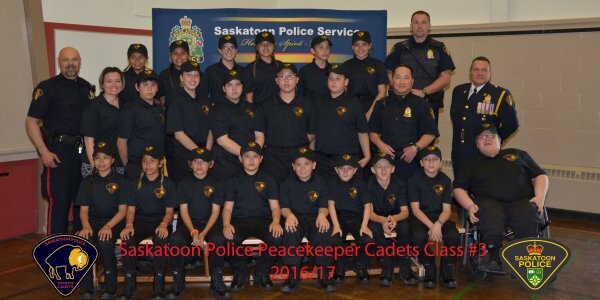 The Saskatoon Police Peacekeeper Cadet Program was launched in October 2014 at Princess Alexandra Community School with the guidance and partnership of the Saskatoon Public School's Dream Brokers Program as a way to help develop stronger connections with students, grades 4 through 8, and the Saskatoon Police Service. The Cadet Program's overall goals are focused in three areas: building trust, physical fitness, and citizenship and culture. Some of the broader values embraced by the program include fostering leadership, discipline, individual goal setting, education, participation in organized sports and community involvement. In its first year, the inaugural Cadets were allowed to take ownership of the program and were the ones who developed the expectations and goals that the group as a whole will continually strive towards. These goals would guide the program and set a benchmark for the future: listen and be respectful; work hard in everything we do; help each other, family and community; be a good influence to those around me; and be a positive role model. A typical meeting includes physical activity such as drill or sports, learning opportunities through guest and community speakers and hands-on activities, and connection and teachings with Indigenous Elders. The Cadet program runs from October through May and preference is given to students from Princess Alexandra School or other schools with a Dream Broker Program. The program has helped forge strong bonds between the Cadets and the police officers involved. In turn, the experiences shared by the Cadets with their friends and families have contributed to better relationships and greater understanding for both police and all those connected to the school and Cadet program. Through the connections between the Cadets and the SPS, there have been other opportunities for the Cadets that take place outside the normal weekly meetings, notably the Horizon 100 Cycling Club Youth Program and Racing for Respect. In the past two years, the Cadets were chosen to take part in the Horizon 100 Cycling Club Youth Program. Here they meet weekly to learn about proper biking and care, technical mastery (bike-handling skills), cycling safety, learning to express speed through increased effort, and building distance and endurance. With the commitment to the program and completion of the final race, the 40 km Gran Fondo, the Cadets are allowed to keep their bike. In 2015, the Cadet program was approached by the Wyant Group Raceway, as they along with many other sponsors, wanted to get the Cadets involved in a racing program, Racing for Respect. The initiative is believed to be the first inner-city racing team. A Bandolero car was purchased and a racing team was chosen from the Cadets. 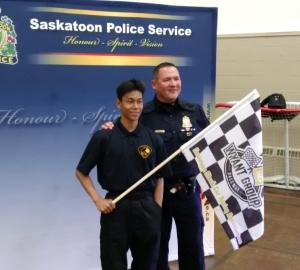 The Saskatoon Police Peacekeeper Cadets racing team will be in action all summer, helping to keep the kids connected during the summer months.